The Crystal of the Day for Friday 25 October 2013 is Wavellite. Wavellite is a phosphate mineral, named after William Wavell, the English doctor who discovered it. 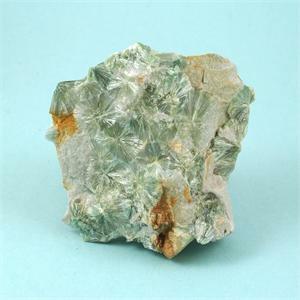 The green colour of Wavellite is produced by the mineral vanadium, which is an aid in sharpening the mental process. Wavellite is a stone for the satisfaction of curiosity. It enhances psychic abilities in an unusual way–it answers inner questions with meaningful synchronicities. If one wishes to know something not within one’s ordinary realm of awareness, one can meditate with a Wavellite, and then look into the events of the coming days for a synchronistic answer. Whilst there are many stones that help in the decision making process, Wavellite is the only one that works at your root level. Wavellite shows a much larger aspect concerning the decision to be made. It shows how this decision fits into who you really are down deep, not just your surface image. Important decisions that may change your life must fit who you really are, not just the circumstances of the day. Wavellite doesn’t give you just one answer, one path. It will help to reveal several alternate paths. For any deep question, there are several ways to achieve the same goal. Wavellite assists us in bringing these paths out of our inner knowledge.